The volatility of a security (historical or options implied) can be used to estimate the short-term range of prices that are expected at various levels of probability, using some basic standard deviation math. You don’t need to know the math, because there are charting tools that do all the work behind the screen. The area on a price chart that covers the probable price range is a parabola laying on its side (a “price probability cone”). As time from the current date to the future date increases, the width of the price probability cone increases. Larger volatility estimates create wider cones, and smaller volatility estimates create narrower cones. The approach assumes a nice symmetrical distribution of price (a normal bell curve). That is not what the real world is like, but it is a fairly close approximator of behavior, and the basis of much of the math involved in options and other risk measuring tools. Black swans, such as we experienced in 2008, kick the stuffing out of probability projections, but most of the time volatility adds value to decision processes by giving moderately reliable clues about the range of short-term future prices. When using short-term historical volatility as the basis, the assumption is that the price volatility that has been happening recently, is probably going to continue in the short-term at about the same level. When using options implied volatility as the basis, the assumption is that options investors have an ear to the ground and eyes on the horizon with a pretty good idea of what lies ahead in the short-term. The statistics are agnostic as to the direction of the price, but you can use other obvious sings (including the simple slope of the price plot) to decide which side of the price cone you wish to assume is more relevant. 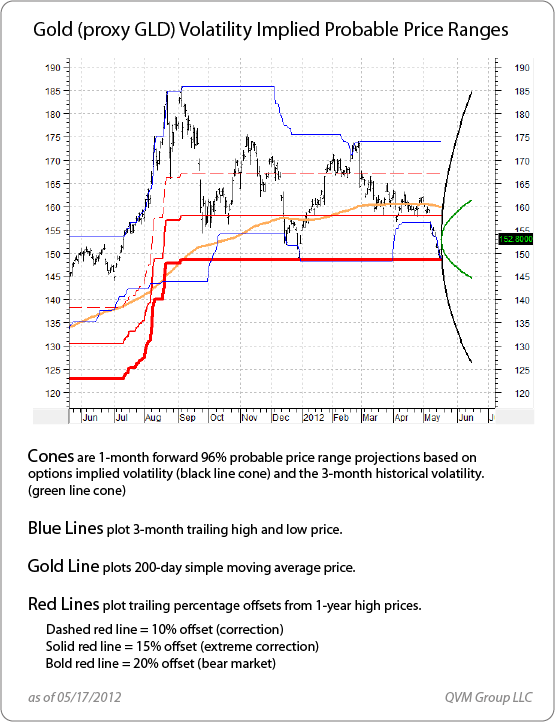 The chart we include in this explanation is for GLD (gold bullion) and is set for a probability of 96% (that corresponds to 2 standard deviations). The math assumes that there is only a 2% chance of prices above the cone, and a 2% chance of prices below the cone. The black cone represents the 96% probable price range for 1 month forward for GLD as of 05/17/2012 based on a volatility rating of 17 (a 17% annualized standard deviation) based on options implied volatility. The green cone represents the 96% probable price range for 1 month forward for GLD based on 3-month historical volatility of the GLD price. The blue lines mark the 3-month price channel. The gold line is the 200-day moving average. The red lines plot offsets from the trailing 1-year high. The dashed red line marks a 10% offset (“correction”). The solid red line marks a 15% offset (“extreme correction”). The bold solid red line marks a 20% offset (“bear market”). If you don’t believe the world will end, high fear times can be a good time to sell short-term (1-3 month) cash secured PUTs on stocks you’d like to own by setting exercise prices outside of price probability cones. If you are certain you’d like to own a stock at that lower price, and confident that you would buy some at that lower price, then why not get paid to promise to do so. Probabilistically, you will not be called upon to perform, but if you are, you buy what you were convinced you would buy at that price any way. Be sure you fully understand what you are doing before trying that. This entry was posted on Friday, May 18th, 2012 at 4:34 PM and is filed under Investment Tools. You can follow any responses to this entry through the RSS 2.0 feed. Both comments and pings are currently closed.